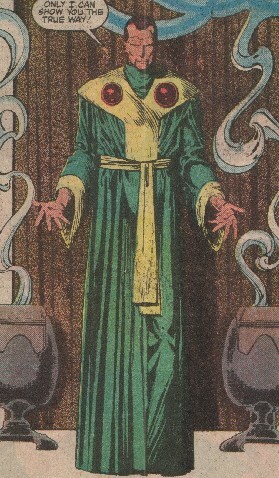 Powers/Abilities: Havelock was a normal human who was an able con-artist and actor, establishing a mystic guru scam with the aid of several others. He was previously (but unsuccessfully) involved in smuggling operations. He could use - and seems to have created - ceremonial clothing that hid micro-electronics for special "magical" effects. Havelock was highly resistant to hypnotism and had garnered a minor reputation to warrant a news article on him. However, he did not actually believe in magic, using it only as a pretense to get money. (Dr. Strange II#65 - BTS) - Ten years prior, Havelock was involved in smuggling operations but was almost caught by the local Indonesian authorities. He escaped to one of the lesser Sunda islands before intending to travel to Australia. On the island, he was cared for by a native mystic, the only other inhabitant of the island. She held off an attack by Nightmare while asleep by using incantations. After leaving, Havelock later decided to use the same mystical lines as part of his scam to swindle people, especially the wealthy, out of their money. He'd been using them for 10 years before Strange found him, but the magical words had already begun to form a transdimensional portal in the barriers between Earth and the demonic Pohldahk realm and the demons there waited expectantly. (Dr. Strange II#65) - Havelock staged another demonstration of his fraudulent magical skills using - unbeknownst to those gathered - a vest that hid micro-electronics and generated fancy light effects. He claimed to sense a skeptic and blasted him with pinkish light, invoking Pohldahk. The apparent skeptic, actually his associate Freddy, claimed that he had seen the light and wanted Havelock to teach him in the ways of mysticism. After the audience had filtered out, Morgana Blessing approached and asked him for an interview for a news story she was writing. She was invited to his Enlightenment Seminar the next day. Once all had left, Freddy came out and the two briefly reveled in their scam. Later, Blessing met with Dr. Strange and told him of the incantations to Pohldahk. Strange was extremely concerned by this and left to speak with the charlatan. At his hotel room, Dr. Strange confronted Havelock and warned from using the magical words but he shrugged it off. Dr. Strange then hypnotized Havelock with the Eye of Agamotto and found out where the charlatan had obtained knowledge of Pohldahk. However, Havelock's associates overpowered Strange who was nevertheless able to escape. The next day, people gathered at the Farrington Estate to see Havelock perform his magic tricks; Blessing and a disguised Dr. Strange were there too. Havelock arrived and Strange pushed forward to entrance him before the charlatan could recite the Pohldahk incantation but was too late. Havelock invoked Pohldahk one more time and this time, it was enough to open a transdimensional portal to one of the planes of Pohldahk and large numbers of various misshapen and malevolent demons surged through. Havelock was terrified and only Dr. Strange's action stopped the attack and he dispatched the demons back to their plane and caused the gateway to vanish. Dr. Strange erased the crowd's memories of the event but Havelock was left to remember what had happened as punishment. Strange also mystically arranged that Havelock would never be able to utter the Pohldahk incantation again. Comments: Created by Roger Stern (writer) and Paul Smith (penciler and inker). Havelock is not actually called Charlatan in the story, but the name is on the cover and title page of this issue, and applies directly to him. Profile by Profile by Grendel Prime. Freddy was an associate of Havelock's who helped him in his mystic scam by pretending to be a cynical businessman influenced by Havelock's would-be magical lights. After seeing the light, he would hide in a nearby room until the crowd had left. He clubbed Strange with an ashtray while Havelock was hypnotized. Gus was one of two musclebound turbaned guards and later sought to stop Dr. Strange from seeing Havelock at the hotel he was staying at. As Strange entered Havelock's mind, Gus lunged at the Sorcerer Supreme but was knocked back by Strange hurling the silent spell of the Seraphim at him. He recovered when Strange was momentarily knocked out but was easily punched away when the mystic recovered. The next day, Gus accompanied Havelock to the Seminar and witnessed the demons of Pohldahk pour in after being invoked by Havelock. His memory of what had happened was likely wiped away by Dr. Strange.